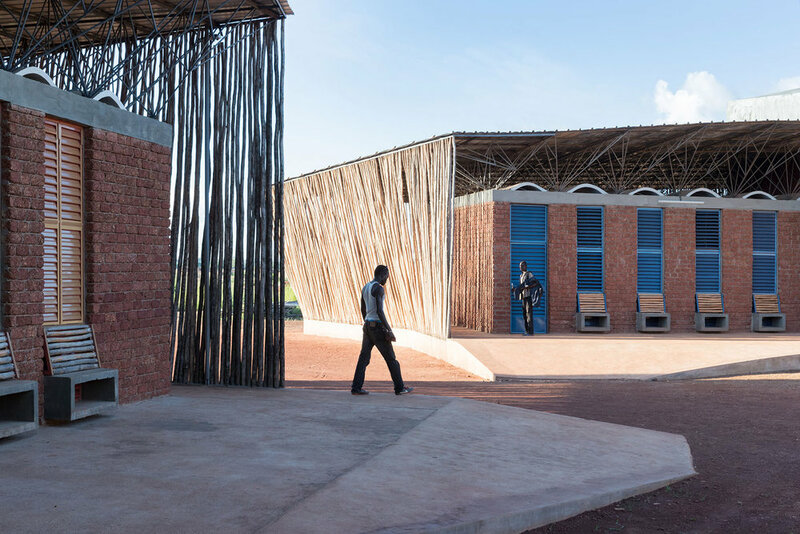 Wind-catching towers emerge from the circular rippled roof of this brick and wood school building in Koudougou, Burkina Faso, which was designed by the architect of this year's Serpentine Pavilion, Diébédo Francis Kéré. 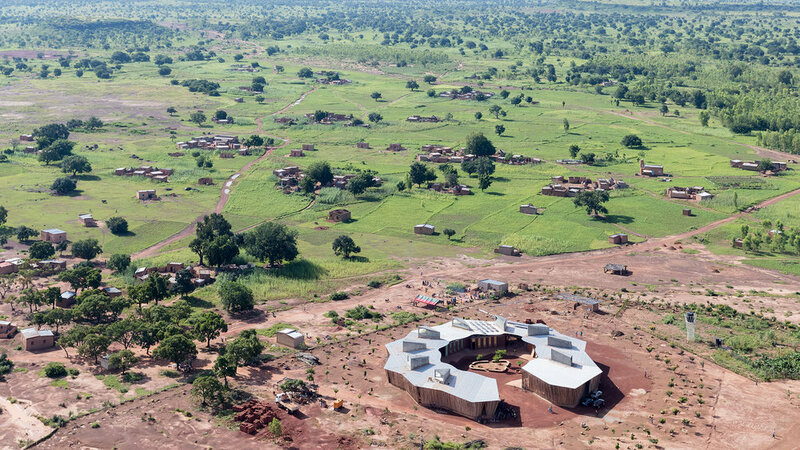 Berlin- and Burkina Faso-based Kéré designed the Lycée Schorge Secondary School for a site on the outskirts of Koudougou – the West African nation's third largest city by population. The secondary school building comprises a series of nine connected modules arranged in a ring formation. These modules accommodate classrooms and administrative facilities, as well as a dental clinic for the students. The school's walls are made from local laterite stone, which is harvested from the earth and then cut into bricks that harden in the air to create a material with excellent thermal mass. Ventilation towers perched on top of the classrooms funnel breezes into the spaces and provide an outlet for stagnant warm air, which is also expelled through apertures created by the undulating vaulted roofs. The overhanging plaster-covered white roofs also protect the interiors from direct sunlight while spreading natural illumination throughout the spaces. An angled screen formed from a local fast-growing wood wraps around the brick-walled classrooms and helps to protect gathering spaces along the outer edges of the building from sunlight and dust. Furniture throughout the school is made using from local hardwoods and materials salvaged from the construction process, including scraps of steel from the roof structure. The building's circular plan results in a protected central courtyard that can be used for assemblies and celebrations by the school or the community. Its also provides privacy and a sense of autonomy from the surrounding area. For the Serpentine Pavilion in London's Kensington Gardens, Kéré created an oval-shaped structure made from indigo-blue wooden batons that is topped with a slatted timber roof. Kéré is from Gando in Burkina Faso, but moved to Germany to work as an apprentice, before studying architecture and engineering at the Technische Universität in Berlin. He is known for his socially driven and sustainable approach to architecture, which he has applied to several projects in his home village, as well as as installations for major exhibitions in London, Copenhagen, Milan, Chicago and Venice.